Extremely budget friendly deck. Volcanion-EX are 2 packs each (Steam Seige packs) at lowest rarity. You can get the 2 Volcanion basics from the structure deck that costs 500 Tokens. 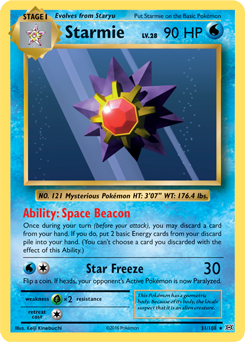 Starmie is 2 for 1 Evolutions pack. Octillery was recently reprinted so it went down a bit. I'd definitely recommend this deck to people just learning the game. This is the new tech in the deck. Being able to recycle your energy at such an easy and fluid pace (coupled with Octillery) is fantastic for the deck. 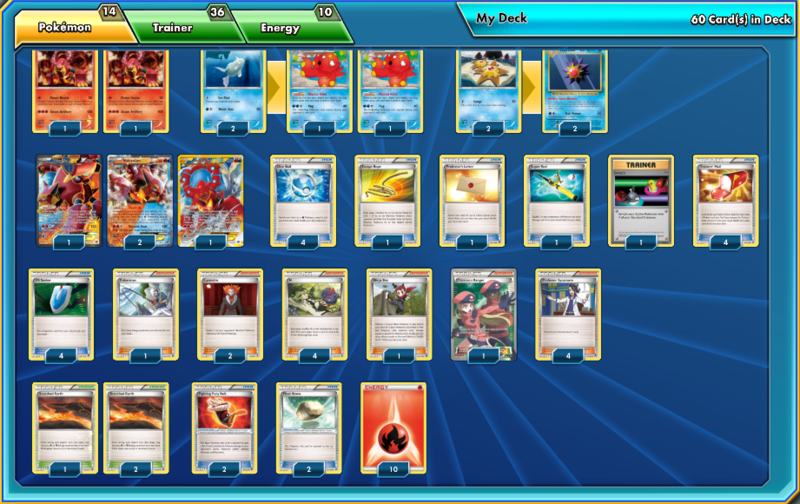 Having 3 Volcanion on the board and using them all every turn is fairly reasonable with Starmie. Dive Ball searches your entire deck except for the basic Volcanions for FREE. No Ultra Ball, no 2 card cost. - I tech 1 Ninja Boy just in case I get a Remoraid/Staryu start with no way to retreat them. Also because I only play 2 basic Volcanion (which is something you could consider playing more of). - Fisherman is probably the most debatable card in the deck for me right now. It feels weird playing Volcanion without it but then again I haven't really needed it. If I was to drop Fisherman I'd add another Float Stone for sure. - I play 2 Lysandre because Garbodor is huge. That's something you really have to look out for when playing this deck. Garbador is basically an immediate loss unless you happen to have 3 energies on a Volcanion-EX + a Lysandre. If Garbodor didn't exist, I'd play this deck a lot more than I currently do. I know this has been up for a while with no discussion, but I'm curious how well this has performed for you with only two of the non-ex Volcanion and no way to tutor for it? Given that Target is selling Volcanion Tins for $10 this weekend, and most of the rest of the deck is cheap, I was looking into making it so I could start playing in local tournaments. With 4 Sycamore, 4 N, 4 Dive Ball, 3 Scorching Earth and 2 Octillery, I usually had a Basic Volcanion ready to attack by my 2nd turn. Ninja Boy helps that out a bit too. You could definitely play 3 Basic Volcanion to increase your odds of finding it, it's a pretty good idea actually. I haven't played in a while but this deck absolutely 100% loses to Garbador, so you might want to build the deck around preventing that from happening. I had a hard time figuring that out so I wish you luck friend. Does Lysandre not do enough to help deal with Garb? I was drawn more towards this simply because it doesn't require multiple Shaymin. I'm not trying to kill my wallet when there's only two or three local events for this game in my area a month. My other option was Greninja, which also loses hard to Garbodor and the new Giratina that comes out in a few weeks. How are you going to kill the Garbodor even if you Lysandre it out? It would require you to have already been set-up and/or spend 3 turns putting energy onto a Volcanion-Ex.